This post is written by Kaitlyn Naylor, a DCCCD intern blogger. 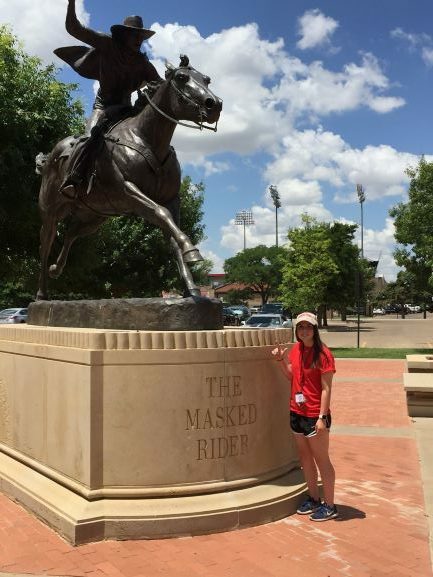 My name is Kaitlyn Naylor and I am pursuing degrees in marketing and sport management at Texas Tech University. I’m a lover of sports, animals (especially my two baby chihuahuas), live music, good books, and activism. Upon graduating from Tech, I hope to attain my master’s degree in sports marketing and continue into a career with a professional sports team/organization. As a teenager, I always pictured going to college and attending a big university in a buzzing city with endless opportunities. Now, midway through my college experience in Lubbock at Texas Tech (definitely fulfilled that whole “buzzing city” part), I realize that although Tech is a wonderful school that I’m incredibly thankful for, I recognize that there was a much less expensive and equally beneficial route to my degree. Going through high school, this idea of mine was similar to that of many of my friends and seemed to be a common theme amongst recent grads. I took this as an indication that going far away to a university was just the “thing” to do. Though counselors and advisors were full of praise for the community college system, it seemed like the concept never resonated with me. So, I set my sights on Texas Tech and decided that moving over to Lubbock for the next four years was a foolproof plan. Sure, they told us about all of the costs that go into university attendance, but it didn’t seem to bother me – that’s what student loans are for, right? Well, as a student who is currently racking up debt from those easy-breezy student loans, let’s just say I’ve got a few things that I wish my high school self would have considered more carefully. The realization of community college benefits was inspired by the things that I’ve learned this summer, of which I’ve had the privilege of interning with Dallas County Community College District. This opportunity has provided me with more extensive knowledge of the district than ever before, as well as a newfound respect for the colleges that it’s represented by. It isn’t difficult to see that these campuses are filled with driven individuals who choose to work hard in everything they do. In my time with the district, I have seen students go above and beyond in order to succeed. This work ethic is mirrored by the faculty, who provide their students with the time and attention needed to help them achieve their goals. Overall, I found that the colleges of DCCCD offer incredibly encouraging and motivating atmospheres – something I was told many times in the past but chose not to take advantage of. Having the opportunity to tour these campuses, interact with current students, and peek behind the scenes of the whole operation has significantly impacted my attitude toward the community college experience. Looking back at my college journey I realize that, although I never thought attending community college for at least a year or two would have yielded multiple benefits for me. While I was always somewhat aware of the cost-effectiveness of this route as opposed to that of a university, experiencing tuition fees first-hand (and having to actually, like, PAY them) gave me a much more rounded perspective. In hindsight, if I would have allowed community college to become an option in my decision-making process, even just for a year or two to knock out my basics, I likely could have saved myself thousands on tuition and living expenses. Now, I say all of this not to bash universities (especially my beloved Texas Tech – wreck ‘em, always), but rather to commend the wildly accommodating nature of community colleges and draw attention to their benefits for those who may not be familiar or may not have given the idea much thought. If attending a university is your dream then by all means, go for it – they offer incredibly rewarding educational experiences just the same. If attending a university is your dream but the funds aren’t quite there yet, don’t be afraid to consider a couple years at a community college – you can always transfer for your higher level/degree specific classes! And if you’re stuck somewhere in a decision between the two, I urge you to give community college – a wonderful, highly overlooked option – more than just a passing glance. How Do I Get Started at Dallas Community Colleges? If you are interested in attending the colleges of DCCCD, we are ready to help you get started on the right path to graduation. Be sure to check out everything that Guided Pathways has to offer. How Do I Enroll? If you would like to attend the colleges of DCCCD, you must apply. Dallas Community Colleges will accept applications through ApplyTexas or you can apply online using the eConnect Application for Credit Admissions. We suggest you apply through eConnect if you’re applying to the colleges of DCCCD only. Please keep in mind that admission requirements will vary depending on if you’re a new student, high school student, transfer, or former student. How Much Will It Cost to Attend? We get it, college is expensive, but it doesn’t have to be when you attend Dallas Community Colleges. We offer classes at affordable prices. Dallas County residents pay $177 per three-hour credit, where else can you find these prices? Check out the tuition costs for yourself, by using the tuition calculator. What About Financial Aid? We have a step by step process mapped out for you. If you should get turned around and need help, contact us at 972-587-2599 or if calling isn’t your thing, send us an email at facc@dcccd.edu.